FC Barcelona failed for third consecutive to claim a victory following today’s 0-0 draw away to Athletic following their draws to Valencia and Real Madrid in the league and Copa del Rey respectively. 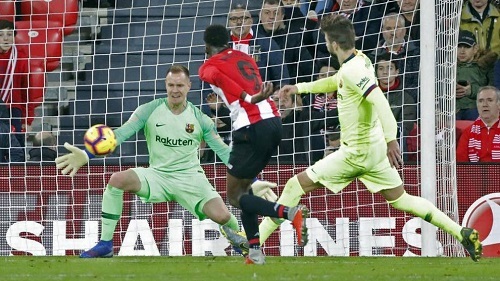 Barça seemed sluggish and their man of the night was Marc-Andre Ter Stegen who pulled off some superb saves to deny the Basque side from victory. Barça’s lead atop of the standings is now 6 points ahead of second place Real Madrid and they will now enjoy 6 days off before hosting Real Valladolid on Saturday. Athletic Club: Herrerín; De Marcos, Yeray, Iñigo Martínez, Balenziaga; Beñat (San José, min. 56), Dani García; Susaeta (c) (Munian, min. 63), Raúl García, Yuri e Iñaki Williams (Kenan Kodro, min. 89). FC Barcelona: Ter Stegen; Sergi Roberto, Piqué, Lenglet (Vermaelen, min. 87), Semedo; Busquets, Rakitic, Arturo Vidal (Aleñá, min. 63); Messi (c), Coutinho (Dembélé, min. 72) y Luis Suárez. Cautions: Dani García (min. 51), Lenglet (min. 71), Busquets (min. 77), De Marcos (min. 68 y 90). Red Cards: De Marcos (min. 90 – second yellow). Previous PostBarça battle Madrid to 1-1 in Copa first leg Semi. Next PostBarça struggle to defeat Valladolid 1-0.